The AMD Radeon RX 580 4GB graphics card turns out to be an excellent option for people who are in search of a graphics card to play the latest video games at high gaming performance of 1440p. AMD claims that this graphics card version offers a much better gaming performance, which is almost 10% more due to its a refined core having higher clock speeds. So, install it in your PC right away and get equipped to play the latest games without feeling the pinch in your pocket. Are you a gamer? Are you planning to buy a gaming laptop? Are you confused about its specifications? If yes, then you are at the right place. Though all the configuration of a gaming laptop should be chosen carefully, the graphics card is the most crucial part of your laptop as it will decide the quality of the graphics of the game. And we don’t think that we should tell you how display quality impacts your gaming experience. Hence, no gamer can deny the fact that a good quality video card is crucial to have a world-class gaming experience. It is a printed circuit board that has a specific memory and processing unit. Though there are several video cards of different brands available in the market, AMD Radeon RX 580 series graphic cards are considered as one of the best mid-range graphics cards for gaming PC. The AMD Radeon RX 580 is nothing but an updated version of its previous model AMD Radeon RX 480. It has some identical features including 2304 GPU stream processors, 32-render outputs, 144-texture mapping units, 36 compute units. It features a slightly high clocked Polaris 10 GPU known as Polaris 20XTX with 256GBps memory bandwidth. It is available in both 4GB and 8GB GDDR5 memory variants. The AMD Radeon RX 580 4GB is the latest mid-range graphics card that will take the recent AAA games to the next level with its 1440p gaming performance and Full-HD resolution. The improved clock speed compared to the previous models gives a certain bump in this range. It has the capability of hitting 60 frames per second (FPS) in most games that assures high-quality console graphics. Being packed with excellent features and available at a reasonable price it has turned out to be one of the most popular graphics cards today. The AMD Radeon RX 580 4GB graphics card is practically designed for those who were not satisfied with the previous models of AMD RX 480 and were waiting to upgrade their gaming rig. This powerful graphics card with its 4GB memory and the ability to deal with modern graphics APIs has made a place in the heart of today’s gamers. The slight bump in the speed gives it that added benefit. The fact that it is so affordably priced makes it super impressive. Thus the AMD Radeon RX 580 4GB graphics card has very little competition in the present market. 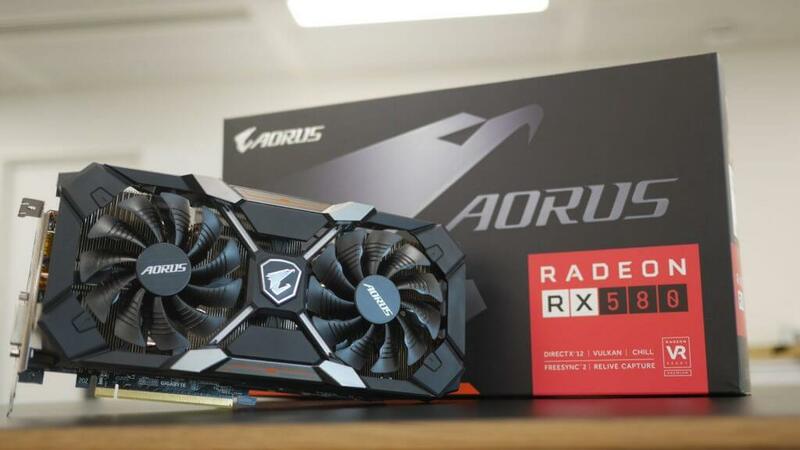 If you are looking forward to buying this AMD Radeon RX 580 4GB Video Card, then it can turn out to be the best option to enhance the display quality of your PC. However, with countless numbers of suppliers available in the market, it is difficult to find the right one, but a little research is worth it. Before you go ahead, you need to check out the detailed review of AMD Radeon RX 580 4GB graphics card. In this guide, we are going to discuss the same. Though AMD Radeon RX 580 4GB Video Card is designed ultimately for gamers, it can be used by the professional designers or architectures who need high-quality CAD drawing. The dimension of this 3-pounds simple graphics card is around 8 x 5 x 2 inches. The video card comes in a classy combination of black and silver with a red stripe on one side. In the front side, there is a unique single blade fan design to control the air flow with the logo of Radeon etched in the center in red color. The black metal plate not only gives it a sleek and tidy look but also provides the required protection. Both at the front and back, there are cooling modules. Being engineered with some of the highest-grade capacitors and chokes the AMD Radeon RX 580 4GB graphics card proves to be highly durable. There are 3 Display Ports and one HDMI on the steel colored case at one end. This version of AMD Radeon RX 580 4GB graphics card is based on the Polaris 20 XLX graphics processor where the GPUs are cautiously crafted onto the silicon. The 3 x Display Ports and the 1 x HDMI outputs are connected with the rest of the graphics card with a PCI-E 3.0 x 16 interface. The card is similar to the RX 480 version with 2304 cores. The Graphics RAM has a 4GB GDDR5 memory that clocks at 8.0 GHz. It also has a memory bus width of 256-bit that pumps out a bandwidth of 256 GB/s. Belonging to the AMD Radeon RX 500 series, it supports most of the popular operating systems. With the help of the 1440p gaming performance and Full-HD resolution, it promises to push the overall act of the AMD Radeon RX 580 4GB graphics card and enhance the visual effect. The memory card chip is clocked at 1340MHz that helps to boost the performance of your computer. The single fan of the AMD Radeon RX 580 4GB video card version is a star performer when it comes to cooling and noise reduction. The AMD Radeon RX 580 4GB offers the best visual effect with a 4 GB GDDR5 frame buffer and 1440p gaming performance. Just like its older version RX 480, it offers a smooth 60fps gaming performance. The enhanced Polaris architecture along incredible VR capability makes it a rockstar. Its performance is impeccable when it comes to popular games like Rise of the Tomb Raider, Total War: Warhammer II, Wolfenstein II: The New Order, etc. One of the biggest reasons why AMD has managed to clock the AMD Radeon RX 580 4GB at higher clock speeds is that the new devices come with 14nm FinFET technology and the 4th Gen GCN architecture. The clock speed of the RX 480 would be anywhere between 1120-1266 MHz whereas the speed of the RX 580 is between 1257-13340 MHz. So that is a huge improvement at least in terms of the GPU hardware. The GPU comes with 4GB of DDR5 RAM that is capable of delivering a full memory bandwidth of 256GB/s. However, if you want to spend more, you can choose the 8GB variant RX 580 as well. It supports 2304 Stream Processors and 144 Texture Units. There are 2 Display Port 1.4, a single HDMI 2.0 port and the DV. Talking about the cost, the price range of the AMD Radeon RX 580 4GB Video Card, it is somewhere within $189-$229. At this reasonable price, you would get a fully capable graphics card for your gaming desktop which supports most of the modern titles and promises to elevate your gaming experience. Advanced Micro Devices, Inc. (AMD) which is an American company that is developing computer processors and other related technologies for not only business but consumer markets too. They have launched this AMD Radeon RX 580 4GB graphics card as part of their RX 500 series that promises to offer massive performance. It is the ideal card for those who want to upgrade their gaming system so that it is capable of playing the recent AAA tiles comfortably. It is practically a subtle advance version of the previous model RX 480. This graphics card has turned out to be a big hit in the market considering its awesome performance at an impressive price.